Our fingerprint facility is convenient for anyone needing live scan fingerprinting in San Diego. We are located just off the I-5 Freeway in Pacific Beach 92109. Our office is located between Mission Bay Dr Branch of Chase Bank and Wienerschnitzel Hotdogs on Garnet Ave.
Our Pacific Beach Live Scan facility is located at 2707 Garnet Ave #3, San Diego 92109. From PB head east on Garnet Ave and turn right into the Chase Bank parking lot where you may park. Alive Scan is located on the second floor next to this parking lot. For livescan location from Mission Beach, take Mission Boulavard and head east on Garnet Ave and turn right into the Chase Bank parking lot where you may park. Alive Scan is located on the second floor next to this parking lot. For live scan fingerprinting services from OB 92107, take Ingrahm Steet and turn right onto Garnet Ave. Turn right into the Chase Bank parking lot where you may park. Alive Scan is next to the parking lot on the second floor. Take I-5 south to exit 23 (Balboa Ave/Garnet Ave), drive past Garnet Ave and immediately pull into the Chase Bank parking lot on your right. We have permission to park at Chase Bank. Alive Scan is located next door to Chase Bank on the second floor. Take I-5 south to exit 23 (Balboa Ave/Garnet Ave), drive past Garnet Ave and immediately p into the Chase Bank parking lot on your right. Look for the live scan next door. From Downtown San Diego, hop on the I-5 Freeway and drive north. Take exit 23A (Grand Avenue/Garnet) and merge onto Mission Bay Drive. Turn left on Magnolia Ave and Right onto Bond Street. Turn right onto Garnet and pull into the Chase Bank parking lot where you may park. Alive Scan is located on the second floor next to this parking lot. For our live scan fingerprinting services from Bay Park, go west on Balboa Ave. Turn Left onto Mission Bay Drive and then take your immediate right into the Chase Bank parking lot where you may park..
For our live scan fingerprinting services from Mission Hills, hop on the I-5 Freeway and drive north. Take exit 23A (Grand Avenue/Garnet) and merge onto Mission Bay Drive. Turn left on Magnolia Ave and Right onto Bond Street. Turn right onto Garnet and pull into the Chase Bank parking lot where you may park. Alive Scan is next to the Chase Bank parking lot on the 2nd floor. For our live scan fingerprinting location from Clairemont, hop on Balboa Ave. 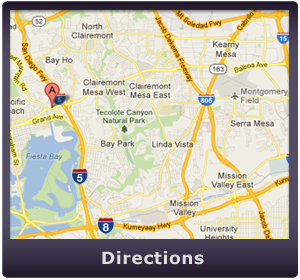 Turn Left onto Mission Bay Drive and then take your immediate right into the Chase Bank parking lot where you may park. Alive Scan is next to the Chase Bank parking lot on the 2nd floor. Take Balboa Ave to Pacific Beach. Go left on Mission Bay Drive and then take your immediate right into the Chase Bank parking lot where you may park. Alive Scan is located on the second floor next to this parking lot. For our Pacific Beach live scan fingerprint location from Linda Vista, hop on the I-5 Freeway and drive north. Take exit 23A (Grand Avenue/Garnet) and merge onto Mission Bay Drive. Turn left on Magnolia Ave and Right onto Bond Street. Turn right onto Garnet and pull into the Chase Bank parking lot where you may park. Alive Scan is next to the Chase Bank parking lot on the 2nd floor. From Mission Valley, take the I-8 West to the I-5 Freeway and drive north. Take exit 23A (Grand Avenue/Garnet) and merge onto Mission Bay Drive. Turn left on Magnolia Ave and Right onto Bond Street. Turn right onto Garnet and pull into the Chase Bank parking lot where you may park. Our Pacific Beach live scan facility is located on the second floor next to this parking lot.